Dallas Personal Trainer - One of the greatest overall total body exercises on the planet! 40 years ago this would have been one of the most common exercises utilized by nearly every single Dallas Personal Trainer, however, due to the influence of bodybuilding and the predominance of the use of machines for the last 20-30 years in the fitness world, many people's core/abdominal muscles have gotten exceedingly weak and it has made it very difficult for them to perform exercises such as this one safely so many personal trainers have shied away from it for some time now. 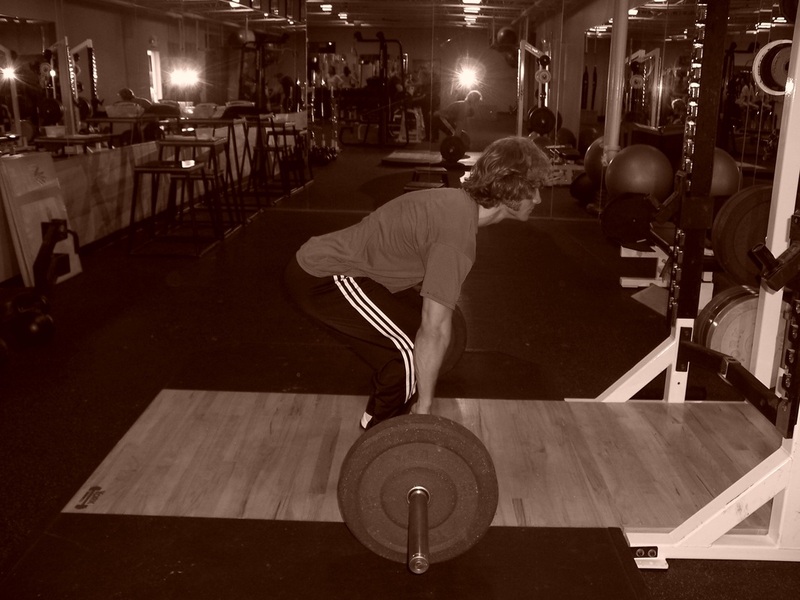 Although deadlifts may appear to be the simplist of exercises, mastering the proper technique on them will take a good deal of practice (much more than with most other exercises). 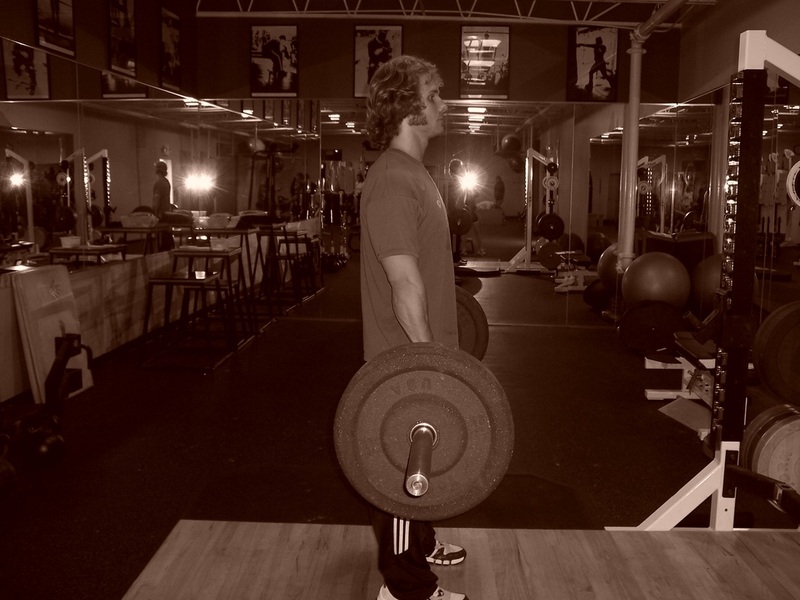 If you are lifting from the floor (using the big plates), step up to the bar so that when you look down, your toes are showing a little on the other side of the bar. Now, with a shoulder width stance, lean forward at the hips and bend your knees as much as is necessary to reach the barbell on the floor, while keeping the back straight and you head up. Grip the bar with an overhand grip slightly wider than shoulder width. As you get stronger, and are lifting a heavier weight, you can grip the bar with one hand underhand, and one overhand (this makes it easier to hold on to the bar without it slipping from your hands). When you get to that point, just alternate which hand is which, every other set. Once your stance is set, tighten all of the muscles in your body (especially your abdominal and upper back areas). To keep the abdominal area tightened in the correct way, create pressure as though you are bracing to take a punch in the stomach. Now, begin to push your feet through the floor to as you push your hips forward to stand up. As you lift the bar, keep it as close to your body as possible throughout the entire lift. Also make sure that you DO NOT try to lift the bar with your lower back or pull your head back. If you pull your head back, your hamstring muscles will be inhibited and your lower back will try to take over to do the work. Simply keep your head in a position that is in line with your torso. Continue to push your hips forward until you are standing completely upright with your shoulders back and your hips pushed forward as much as possible (you should feel your glutes (rear end muscles) contracting tightly at the top). Once you reach the top, smoothly lower the bar back to the floor exactly the way you lifted it, and go on to the next rep (make sure to keep the abdominal area tight as you do this). The primary muscles that you should be using to lift the bar are the glutes and hamstrings (you rear end and the back of you thighs). However, if you do not keep the bar held in close to your body, you will inevitably put a large strain on your lower back instead, so make sure to keep the bar in close. This will require you to keep your lats (your arm-pit/upper back muscles) tight throughout the entire movement. If you are not using big plates, you will pick the bar up from a rack and begin the lift from the up position. Instead of lowering the bar to the floor, you will simply lower it as low as possible without rounding your back. Other than that, the technique is exactly the same (read the preceding paragraphs).